How much information can you pack into 40 pages? A lot. Yeah, but can it be useful and make you think? Yep. How do I know? I just read “The Little Book of Sanctuary” by Alison Marks. This cute little book is a step by step guide to reevaluating your relationship with your home and implementing change into your space. Marks is the founder of Inside Out Design Coaching in San Francisco. (Incidentally, she has a great blog called Spirit in the City that I check in on from time to be shown the coolness that is San Francisco.) Whether it’s showing you the beautiful, useful, loved test for cleaning out your belongings or setting up a plan to redecorate your home, Marks makes the challenges seem less daunting and the process useful for home and spirit. All in book that easily slips into the back pocket of your jeans. Can I make a suggestion? Are you throwing a New Year’s Eve party or attending one? At $5.45 this seems like the perfect party favor or hostess gift at New Year’s resolution time. Also, perfect for housewarmings. I told my husband if I ran a new age gift shop or home décor store I would put a rack of these at the register. It’s the perfect little gift book, and the old retailer in me knows it’s a perfect little impulse buy! So what are you doing still reading this? Buy it already! 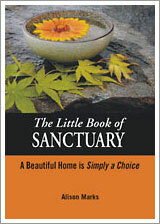 Click here to learn more about The Little Book of Sanctuary and other Our little Books.